All content following this page was uploaded by Deanne Bird on 22 February 2016. Manuscript under review for journal Nat. Hazards Earth Syst. Sci. c Author(s) 2016. CC-BY 3.0 License. complaints and behavioural problems (Masten et al., 2015; Newman et al., 2014; Norris et al., 2002). change and reduce the risk of disasters (Back et al., 2009; Haynes and Tanner, 2015; Mitchell et al., 2008; Tanner, 2010). specified that DRR had been integrated within their national education curriculum (Ronan, 2014). of hazard-related fears, and more stable risk-perceptions (Ronan et al., 2010; Ronan and Johnston, 2003; Ronan et al., 2001). using quantitative methods and mainly limited to involving students and teachers (Amri, 2015). conducted within the Indonesian context. advocating and facilitating DRR in many developing countries, including Indonesia. facilitating DRR in many developing countries, including Indonesia. following section provides description on the case study location. geological and climate-related hazards with high vulnerability (Swiss Re, 2014). World Vision, Plan International, and Mercy Corps (Brown and Dodman, 2014; UNISDR, 2012; World Bank, 2014a). 251 primary schools in Jakarta could not access their school for three to four weeks due to flooding (Education Cluster, 2013). times more than those caused by floods in the same period, which totalled 43 (BNPB, 2014a; BPS, 2015). teachers by providing mandatory certifications through courses and professional development (Chang et al., 2013). Committee of Macquarie University (Ref Number: 5201400846). of the underlying problems (Sayer, 1992). The research was completed between late November 2014 and mid-January 2015. Each stage of the research is discussed in the following sections. 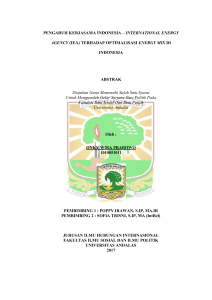 research, including findings from previous studies that were adjusted for the Indonesian context (see supplementary material). approach was used in designing the children’s questionnaire. facilitators and deterrents and 5) teachers’ training in DRR. whether or not school personnel are aware of current policy. The questionnaire was pilot tested with several academic colleagues expert in this field. risks they faced and disaster-related terminologies and approaches, including DRR education. did not discuss their responses with each other. whose age ranged from 22 to 59 years (M = 43.71, SD = 11.23). Descriptive statistics in Microsoft Excel were used to analyse the data. UNICEF, Save the Children (STC), and World Vision Indonesia (WVI). agency did not respond to the invitation and the other was unable to attend due to unforeseen circumstances. of issues related to CCDRR (Kitzinger, 1995). sustainability and scaling-up; strategies used to overcome problems; and, other issues linked to sustainability and scaling-up. implementing DRR education as identified through the school personnel questionnaire. asked for their permission to be audio recorded. in the FGD and shared their own perspectives and experiences. The discussion lasted for 1 hour and 40 minutes. QSR NVivo 10® using a thematic and inductive approach. ranging from 9 to 12 years of age and one 14 year old child (M = 10.48, SD = 0.76, comprised of 73 girls and 67 boys). (Bell, 2007; Borgers et al., 2000). floodwater reached one metre in depth, forcing the school to be closed for a week on both occasions. school with one school principal (female), 22 teachers (11 female and 11 male) and two personnel as school guards (all male). secondary hazards (i.e. water-borne diseases) after floods (WHO, 2013). reduce pressure and avoid participants answering randomly. conducted by Save the Children (2014). changes made to the questionnaire, the results of the pilot survey are not included in the analysis presented here. monsoon season (usually expected in early February). The data collection took under one hour each day. The survey participants (students) sat in the class room while the facilitator read out loud the questionnaire in front of the class. not affect their academic standing. The whole process was supervised by a teacher. During the process, discussion about question clarification was encouraged. level of knowledge in DRR and others who require more learning. preparedness plans for their homes (61%) and school (57%). increase the risks faced by children and 39% believing that children should not be actively involved. receiving the highest score for a single method (38%). 32% in relation to disaster preparedness. Most children correctly identified the hazards that may impact their homes (79%, n=140) and their school (62%), i.e. their homes or school, i.e. tsunami, landslides, volcanic eruption, drought, or forest fire. that they are sometimes worried, scared or upset when thinking or talking about disasters. and, fire prevention and safety, respectively. child did not want the disaster to happen in the first place. in preparedness activity]”, and “because it [being involved in preparedness activity] makes things difficult”. activities with: their mother (75%), father (55%), friends at school (41%), siblings (19%), and neighbourhood friends (13%). disaster practices and/or simulations at home and less than half (49%) report having a written household preparedness plan. preparedness plan (personal communication with school principal, 2014). school (83%) and their homes (86%) better prepared. categorised into four main issues. The following section described each of the main issues. system does not assess implementation or evaluate progress and effectiveness of DRR programs in schools. This inevitably restricts the ability to implement a comprehensive package for a school-based DRR program. participant pointed out that there are opportunities for funding at the local level by tapping to the village funds. perspectives of school personnel, children, and NGOs. that they know how to stay safe in a disaster. have the correct knowledge, are able to practice it when needed, or are necessarily better prepared (e.g. Whittaker et al., 2013). factor. Each of these seven key issues is discussed in the following sections. education content, financial matters and school practice. HFA with numerous countries developing DRR, or CCDRR, policy that is more “aspirational” than realised (Ronan, 2014). community stakeholders. All were done by professional evaluators, with over 90% being those in higher academic settings. barrier for scaling-up and ensuring sustainability. guidelines and teaching resources produced by agencies such as the Red Cross (2009) and Save the Children (2007). messages (Ronan et al., 2010; Ronan and Johnston, 2003; Ronan et al., 2001; Shimura and Yamagata, 2015; UNESCO, 2014). For examples of key DRR messages see IFRC (2013). for inclusion in the resource materials for DRR education in schools. Christchurch earthquake (Johnson and Ronan, 2014). number excludes training for trainers and associated monitoring components. A systematic way to improve teacher’s capacity is by integrating DRR education in higher education programs for teachers. of teachers over a short period of time in Turkey (Petal and Sanduvac, 2012). could inspire other teachers to follow in their footsteps. emergency response, when in fact they also have a role in building preparedness. provide trusted and credible information for the students regarding DRR. even when there is a lack of dedicated DRR funding. simulations, teacher training, inviting experts to schools, and developing school disaster management plans. significant obstacle to children’s participation in DRR through schools or classrooms where this perception is prevalent. active involvement brings added value including to the resilience of the community (Amri, 2015). including expanding the sample size of the participants and replicating the study to other areas in Indonesia. personnel and budget; and, children’s participation in DRR education and measures. in DRR education. A competition at the national level could also motivate “champions” in DRR education. for participants who have access to the technologies. management agencies. Schools should also be part of the local DRR forum. village funds where the government is disbursing development funding to be managed at the village level. sector staff (including those in the emergency management sector). may be applicable beyond Indonesia. and Vries, R. d. (Eds. ), SAGE Publications Ltd, London, UK, 2010. 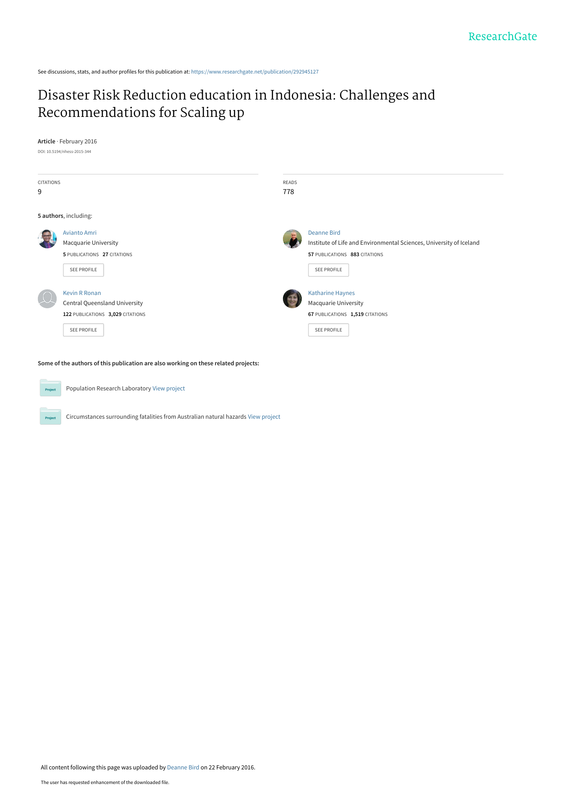 Bell, A.: Designing and testing questionnaires for children, Journal of Research in Nursing, 12, 461-469, 2007.
response to a volcanic eruption in southern Iceland, Bulletin of volcanology, 73, 1209-1227, 2011. Natural Hazards and Earth System Science, 9, 251-266, 2009. BNPB: http://dibi.bnpb.go.id/DesInventar/dashboard.jsp?countrycode=id, last access: 26 December 2014. Quality 1, Bulletin de Méthodologie Sociologique, 66, 60-75, 2000. BPS: Jakarta In Figures 2014, Statistics of DKI Jakarta Province, Jakarta, Indonesia, 2015.
urban disaster risk reduction in Asia: Insights from Dhaka, Kathmandu, Manila and Jakarta, IIED, London, UK, 2014. Indonesia : the role of politics and evidence in policy making, World Bank Group, Washington DC, USA, 2013.
disaster and climate risk in cities, World Bank, Washington DC, USA, 2012.
last access: 15 March 2015 2015.
for the 3rd U.N. World Conference on Disaster Risk Reduction, 2015, GADDRESS & UNISDR, 2014. 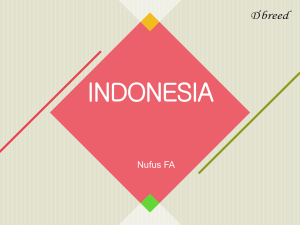 Government of Indonesia: Child Protection Law, Law no. 23 Year 2002, Government of Indonesia, Jakarta, Indonesia, 2002. Hoxby, C. M. (Ed. ), University of Chicago Press, Chicago and London, 2003. Volcanology and Geothermal Research, 172, 259-272, 2008.
a tool for climate change adaptation and disaster risk reduction, Children's Geographies, 13, 357-371, 2015. IFRC: Public awareness and public education for disaster risk reduction: key message, IFRC, Geneva, Switzerland, 2013. Indonesian Red Cross: Sekolahku Aman, Bersih, dan Sehat, Indonesian Red Cross, Jakarta, Indonesia, 2009.
earthquake, Natural Hazards, 72, 1075-1092, 2014.
primary schools, Disaster Prevention and Management, 23, 370-380, 2014. 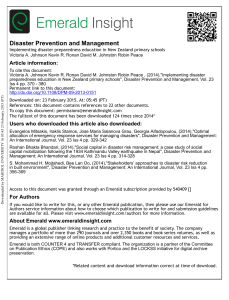 Disasters, Journal of Contingencies and Crisis Management, 8, 223-228, 2000. Kitzinger, J.: Qualitative Research: Introducing focus groups, BMJ, 311, 299-302, 1995. Krueger, R. A. and Casey, M. A. (Eds. 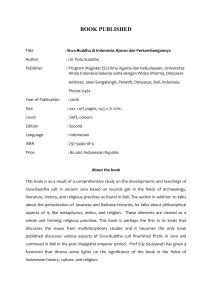 ), Sage Publications, Inc, USA, 2015. Psychology and Developmental Science, Lerner, R. M. (Ed. ), 4, John Wiley & Sons, Inc., New Jersey, USA, 2015. Children Youth and Environments, 18, 254-279, 2008. Interventions for Children Survivors of Natural and Man-Made Disasters, Curr Psychiatry Rep, 16, 1-10, 2014. 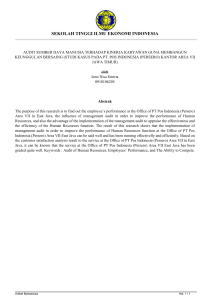 Norris, F. H., Friedman, M. J., Watson, P. J., Byrne, C. M., Diaz, E., and Kaniasty, K.: 60,000 disaster victims speak: Part I.
OECD/Asian Development Bank: Education in Indonesia: Rising to the challenge, OECD Publishing, Paris, 2015.
perspectives, Journal of Volcanology and Geothermal Research, 172, 179-188, 2008. Children Youth and Environments, 18, 1-29, 2008. Individual and Household Preparedness and School Disaster Management, RiskRED, Turkey, 2012. Plan International: Child-Centred DRR Toolkit, 2010. Pendidikan Dasar dan Menengah, SCDRR - UNDP, Jakarta, Indonesia, 2009. UNICEF, Paris, France & Geneva, Switzerland, 2014. Ronan, K. R. and Johnston, D. M.: Hazards Education for Youth: A Quasi‐Experimental Investigation, Risk analysis, 23, 10091020, 2003.
education survey, Australasian Journal of Disaster and Trauma Studies, 1, 2001-2001, 2001.
government policy, Institute for Resource Governance and Social Change, Kupang, Indonesia, 2013. Save the Children: Baseline Study Report - Disaster Risk Reduction "Pengurangan Risiko Bencana di Sekolah Terintegrasi"
(DRR PRESTASI), Save the Children, Jakarta, 2014. Komunitas, Save the Children, Bangkok, Thailand, 2007. Sayer, R. A.: Method in social science: a realist approach, Routledge, London, UK, 1992. 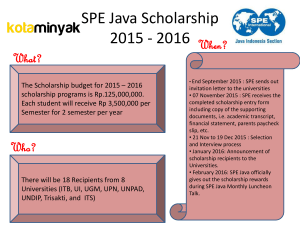 Support Project, and Trends in Geography Teaching Practices, Geography Education in Japan, 3, 221-233, 2015. Swiss Re: Mind the risk - A global ranking of cities under threat from natural disasters, Swiss Re,, Zurich, Switzerland, 2014. 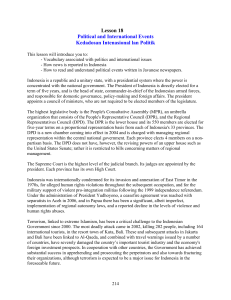 OF SOCIAL VIOLENCE IN THE CONTEXT OF TRANSITION: THE CASE OF INDONESIA, July-December 2002, 1990. Children & Society, 24, 339-351, 2010. Towers, B.: Children’s knowledge of bushfire emergency response, International Journal of Wildland Fire, 24, 179-189, 2015.
and opportunities, Australian Journal of Emergency Management, 29, 31, 2014. UNESCO: Stay safe and be prepared: A teacher’s guide to disaster risk reduction, UNESCO, Paris, France, 2014. UNICEF: The State of the World's Children 1996, Oxford University Press, New York, USA, 1996. UNICEF: The state of the world's children 2014 in numbers: Every child counts, UNICEF, New York, USA, 2014. UNISDR: Commitments to Safe Schools: Summary Report. UNISDR, Geneva, Switzerland, 2015a. 2008, UNISDR, Geneva, Switzerland, 2008. UNISDR: Sendai Framework for Disaster Risk Reduction 2015-2030, UNISDR, 2015b. United Nations: Convention on the Rights of the Child, United Nations, 1989.
preparedness and mitigation, United Nations, Yokohama, Japan, 1994.
bushfires: an analysis of household preparedness and response, International Journal of Wildland Fire, 22, 841-849, 2013.
WHO: Child Health. In: Disaster Risk Management for Health Fact Sheets, WHO, 2011.
WHO: Communicable disease control in emergencies: A Field Manual, 2005. Reed, B. (Ed. ), WHO, Geneva, Switzerland, 2013. 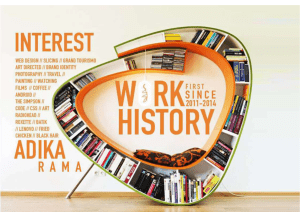 World Bank: World Bank and Education in Indonesia, World Bank, Jakarta, Indonesia, 2014b. 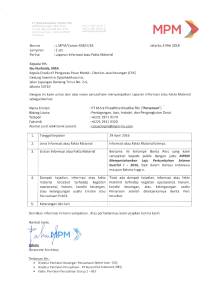 press release - PT Mitra Pinasthika Mustika Tbk.